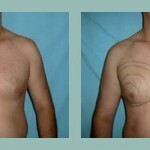 Gynecomastia is the name for condition of over-developed or enlarged breasts in men. It is the most common breast disease in men. It is estimated that 70% of teenagers and 40% of adults are affected in some degree by this pathology. It is usual that 13 or 14-years-old teenagers develop gynecomastia to a certain degree, but this is considered physiological or “puberal”. In more than 90% of cases, it solves within a year. In adults, gynecomastia is associated to age increment, probably related to testicular hypofunction and the increase of adiposity. 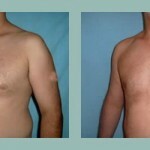 There are pathological conditions related to the androgenous deficiency or excess estrogens that predisposes gynecomastia. 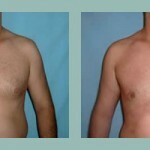 Treatments with anabolics or other medicines can generate a gynecomastia. The possibility of the breast cancer must be considered in an adult with abnormal mammary tissue growth. We perform all the pre-operative exams and make a meticulous clinical evaluation, in which the treatment strategy is decided. The extirpated tissue is sent to the laboratory. The correction of the “glandular” gynecomastia usually satisfies the patients very much, since with just a small periareolar incision we resect the excessive mammary tissue. We complement it with liposuction of the surrounding fatty tissue. If the gynecomastia corresponds solely to fatty tissue (lipomatose), it can be removed by means of liposuction, with minimal incisions of 3 millimeters. The surgical time varies from 60 to 90 minutes. We habitually give local anesthesia plus sedation, provided by an anesthesiologist, for the patient´s greater comfort. The surgery is ambulatory (no in-patient stay) and a compressive lycra bandage has to be used during the post-operative. The pain or discomfort in the first 24 to 48 hours of the post-operative is handled with analgesics. Later, the evolution is very well tolerated. The possibility of complications is the normal to any other surgical procedure, such as: hematoma (bruising), seroma (swelling), infection, unfavorable scars, etc. The patients retake their daily routine without making efforts after a few days. More time should be waited to retake physical activities, though.